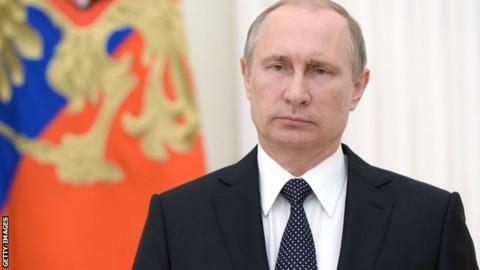 Russian President Vladimir Putin said "there can be no place for doping in sport" after his country's athletes were told their ban from this summer's Olympics remained in place. Russian track and field athletes are banned from Rio 2016 after claims of a state-sponsored doping programme. Putin said: "Sport must be clean and the health of athletes must be reliably protected." He wants Vitaly Smirnov, 81, to lead a new anti-doping commission. Smirnov is an honorary International Olympic Committee (IOC) member and an experienced Russian and Soviet sports administrator. Putin said he had an "absolutely unimpeachable reputation'' and "the trust and respect of the Olympic family". The Russian leader wants the new commission to provide "rapid development and tough control for the effective realisation of a national plan on the fight against doping". In an earlier statement, he said: "Everyone knows very well the situation around our application for the Rio Olympics, and the well-known decisions associated with the use of doping. "In this connection, I want to stress once again: the official position of the Russian authorities, the government and the president, all of us, is that there can be no place for doping in sport." Separately, the IOC is considering calls to ban all Russian competitors from the Rio Games following a second report into state-sponsored doping. It found evidence of Russian urine samples being "manipulated" across the "vast majority" of summer and winter Olympic sports from late 2011 to August 2015. Former Soviet president Mikhail Gorbachev said he was "saddened" by the "unacceptable" prospect of a total ban on Russian competitors. Gorbachev, the last General Secretary of the Soviet Union, has written an open letter to the IOC. In it, he said: "I support the fight against prohibited substances in sport. It is evil that must be eradicated. Those athletes who are proven to have doped should be banned from competitions. "I am deeply worried by the fact there also were Russian citizens among officials and athletes who used doping and falsification for the sake of 'victory at any price'. "At the same time, I am concerned and deeply saddened by the possibility that in case all Russian athletes are banned from competing in the Olympic Games, the innocent will be punished together with the guilty. "The principle of collective punishment is unacceptable for me. I am convinced that it contradicts the very culture of the Olympic movement based on universal values, humanism and principles of law."